I knew going in that the Jackie Chan / Chris Tucker combination is one that works, and works well. It seems that these two were made to be together on-screen. 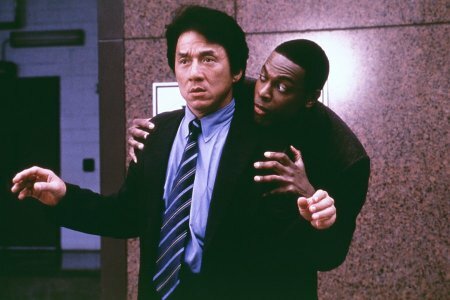 And after seeing and thoroughly enjoying the original Rush Hour, I wanted nothing more that to continue with the fun right where the first one left off. And Rush Hour 2 delivers. What is more is that this time around it seems that everything is just a little bit better, which is quite unusual for a sequel. The plot, the villains, the action, and the humor have all been turned up a notch for Rush Hour 2, and audiences across the globe could not be more pleased. What is great about this set of movies (for there is surely to be at least a 3rd one made) is that one need not have seen the first one to enjoy the next one. In the original, we are treated to the very funny conflicts that arise when these two independent, and very different, undercover cops are placed on the same assignment. In the sequel, we see a friendship that grows between Inspector Lee (Chan) and James Carter (Tucker) throughout the film as they take on a crime lord dealing in counterfeit bills. Lee is always focused, always determined, always serious. Carter is, well...Carter likes to have fun on the job. Each movie is self-contained with its own plot and ending, and they can be seen independently of one another. However, seeing both is a treat of which I would definitely suggest that you partake. 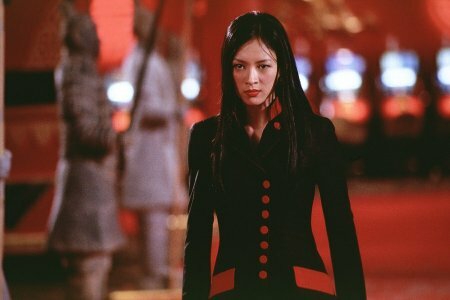 And for those who have seen the high-flying Crouching Tiger, Hidden Dragon, you will enjoy as I have the appearance of Zhang Ziyi (below) one of the bad guys, er, um, girl (as she does oh so well!). Her acrobatic martial arts fighting style should be a bit familiar. This time around, though, she has a bit darker role as her evil stare suggests. I also enjoyed the fact that this movie put each of the Chan/Tucker duo in his own element, leaving the other out to dry (both figuratively and literally, in some cases). The film begins in Hong Kong where James Carter sticks out like a sore thumb. When Lee tells him to try to blend in, Carter exclaims something to the effect of "How am I supposed to do that? I'm two feet taller than everyone in here!" Whether in Hong Kong, or in Los Angeles, each place that these two visit offers its own unique set of thrills and laughs. For instance, we see them in a Hong Kong Karaoke bar (where Carter just can't help himself from portraying Michael Jackson), a massage parlor (where Carter just can't help himself from the beautiful oriental women), a yacht (where Carter just can't help himself from...well, you get the idea). When the movie took its show on the road to Las Vegas for the grand finale, I was a bit leery. I have rather bad memories of movies which just took it too far by ending in the city that never sleeps (case in point, Con Air). However, with this movie it was both appropriate and wildly entertaining. By the time the movie finished, I was about out of breath from excitement and laughter. I do have two bones to pick with this movie, however. First of all, one should be forewarned that whenever an American film crew creates a movie starring Jackie Chan, they always ruin it by not giving him enough screen time to devote to his intricate stunts. It seems that the American Hollywood prefers witty dialogue over fast-paced action; this is a mindset which I disagree with 100%. For those of you who have only seen Jackie Chan in films such as Rush Hour, I really encourage you to take a look at something like his Rumble in the Bronx or Supercop. My second frustration with this movie was with how far Tucker's Carter insisted on putting down white people. Don't these people realize that their primary audience is white people? They are biting the hand that feeds them. During one such tirade in the film, the awkward tension created in the theater was so thick that you could cut it with a knife. Hopefully Tucker's flashy smile and silly antics will allow us all to forgive him. One final note: When you see this film, be sure to stick around for the closing credits because there you will find a treasure trove of hilarious out-takes. As is common for all Jackie Chan movies, we get to see which of his stunts required more than one take as we wonder how this man is still alive. We are also treated to Chris Tucker's sense of humor off-screen (which doesn't seem very different from his character, James Carter). In one such out-take, Tucker takes a phone call in the middle of the filming of a scene. Jackie Chan and Chris Tucker did it again! And I can't wait to see Rush Hour 3. 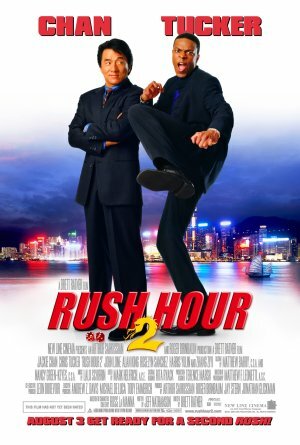 How would you rate the movie Rush Hour 2? There have been 25697 people to visit this page since Fri, Aug 10, 2001. And you are the first person to visit this page today!